ROC the Day in 6 Days! ROC the Day is December 2! Are you as ready to ROC as we are? Join us on Tuesday, December 2 starting at midnight to ROC the Day for Rfalconcam. Did you know that every odd hour (1 AM, 3 AM, etc.) one lucky ROCstar (that’s you!) will be randomly chosen to give an extra $500 bonus to the charity of their choice? There are 12 chances to win! And did you also know that on the even hours, the organization with the highest number of donors for the preceding two-hour period will get an extra $1,000? 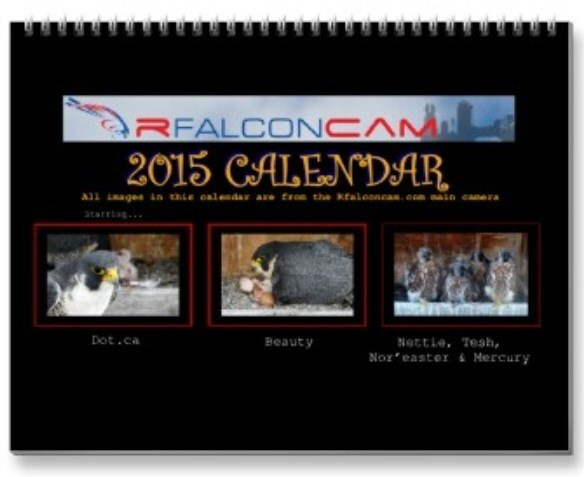 The 2015 Rfalconcam Calendar is now Available! 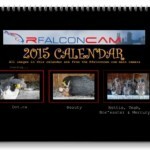 The Rfalconcam 2015 calendar is now available and ready for sale at our Zazzle store just in time for the holidays! There were some stunning images captured by our main camera this year. So many to choose from. Many thanks to this year’s contributors; Annette, Ginny, Pat, Donna, Teresa, Kris, Ei (Dumpsterkitty), Kathy, Lisa, Dana and Carol. Please consider purchasing one for yourself to help support the Rochester Falconcam. Special thanks to Merchandise Team Member Dana for putting this calendar together. All your hard work is much appreciated! 2014 Was a Successful Year for the Rochester Falcons! If you’ve been following the RFalconcam Falcon Watch Blog, you know that all four of the young falcons that hatched on top of the Times Square Building have fledged successfully. Nor’Easter, Tesh, Mercury and Nettie have left the area. We wish them well as they begin their journey and we hope to hear about them in the future. We would like to thank all the folks that came out to help with the fledge watch this year. 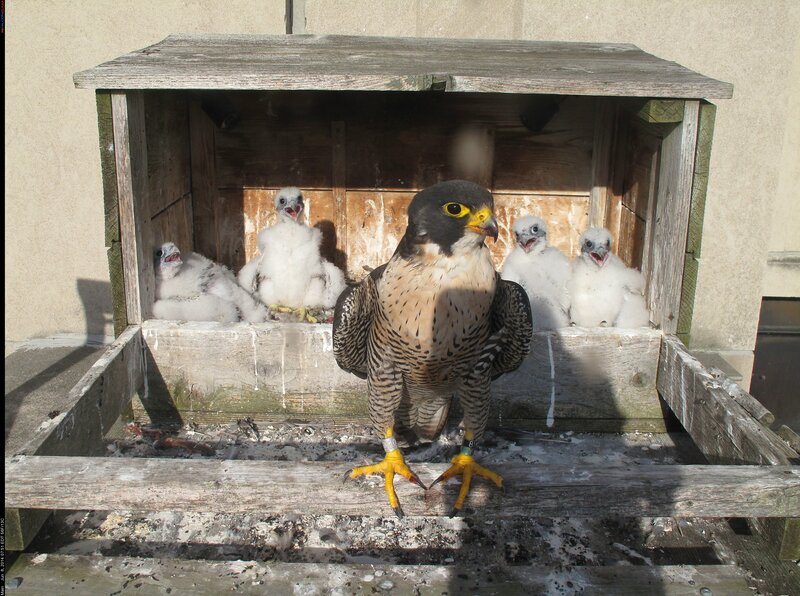 To keep an eye on the young Peregrine Falcons as they took their first flights and trained with their parents, Beauty and Dot.ca. There were a few anxious moments, including a premature fledge when a strong gust of wind swept Tesh off of the wall near the nest box. She ended up on a low awning above the sidewalk on the corner of Main St and Exchange. The Rochester Falcon Watchers gathered to surround the area and keep her safe until she was strong enough to fly again. 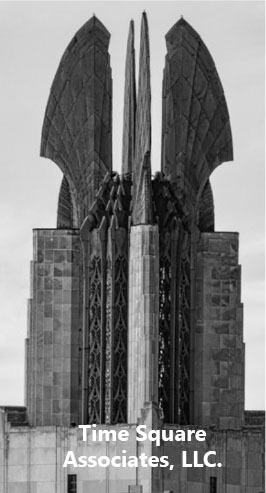 When she did take off, she gained altitude and landed on top of a taller building where she remained for the evening. 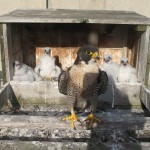 The next morning Tesh was off and flying well, eventually making her way back to the nest box and her family. We had more good news, this time from Syracuse, NY. Pigott, who had been hanging out for the last few years on a building south of downtown Rochester, was positively ID’d as the new female at the Syracuse nest site. She left Rochester in March and it didn’t take her long to find a new territory and mate. We were thrilled to hear that she successfully raised a daughter. 2014 was a very successful year for the Rochester Falcons! The following is from June Summers. From Genesee Valley Audubon Soc. You are currently browsing the Imprints blog archives for November, 2014.